Ireland's Paul Stirling catches Pakistan's Babar Azam off Tim Murtagh. Ireland’s first Test appearance was delayed by 24 hours after rain washed out day one of their inaugural Test against Pakistan. But day two has proved to be worth the wait for the Irish. Pakistan’s Test debutant Imam-ul-Haq was involved in a moment of drama off the first ball of the Pakistan first innings. Tim Murtagh pushed the first ball right up to Azhar Ali, who dabbed it away and set off for the single. Imam then got tangled up with Irish keeper Niall O’Brien, who banged into Imam’s head as he attempted to kick the ball into the stumps in an attempt to run him out, in the process knocking the batsman to the ground. Imam required treatment for a few minutes before he was able to recover his composure enough to face his first ball in Test cricket. Imam later fell lbw to Murtagh for seven off 26 balls, including a four. 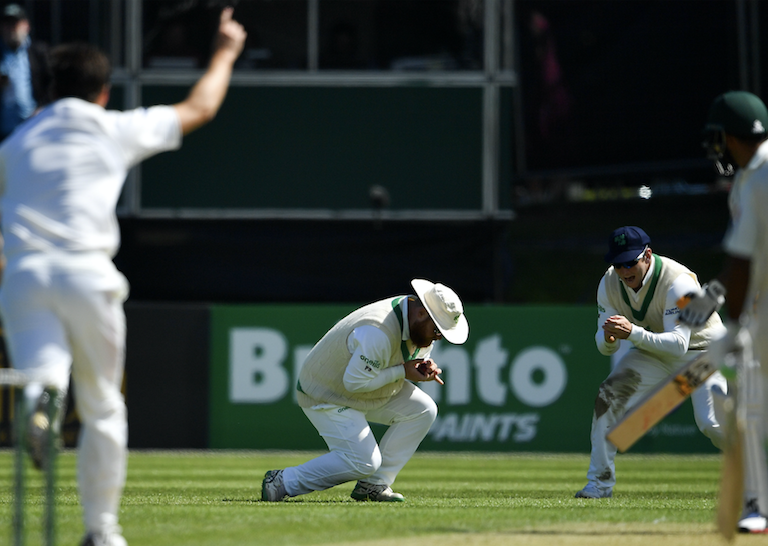 An historic moment as Ireland make their Test debut… and the first ball sees drama as Pakistan debutant Imam-ul-Haq is knocked to the ground going for a quick single. Thankfully he got to his feet to face his first ball. Ireland's first two overs were very well bowled and it looks like a highly competitive match is in stall for us. Video clip filmed from Supersport's coverage on channel 211. Imam’s uncle, Inzamam-ul-Haq, was renowned for having difficulties running between the wickets, and was run out 38 times during his 14-year ODI career – 11.80% of his dismissals were run-outs. This places Inzamam in joint top spot of the world run-out rankings, along with countryman Wasim Akram. Inzy’s running between the wickets often looked clumsy although, in his defence, he doesn’t feature on the list of most Test run-outs, nor is his name anywhere to be seen in the list of batsmen who have run their partners out the most in either Tests or ODIs. Reputations are, however, often established early, and it was Inzy’s horror spell at the 1992 World Cup that set his reputation in stone, being run out four times in five consecutive innings… the first of which was the famous Jonty Rhodes run-out which catapulted the KZN fielding magician on to the headlines of the world’s media. Ireland’s first ever Test wicket came after 37 minutes when Boyd Rankin (the only Irishman with previous Test experience, having played one Test for Australia) had Azhar Ali caught in the slips by Irish captain William Porterfield for four off 23 balls. The wicket fell on the last ball of the seventh over, and the next ball Imam fell lbw to Murtagh. Ireland almost completed a team hat-trick as new batsmen Haris Sohail and Asad Shafiq conspired to mess up their calling, leading to a run-out throw that, had it hit, would have seen Sohail run out without facing a ball. All of Ireland was beaming when Pakistan captain Sarfraz Ahmed was caught by Paul Stirling off Stuart Thompson for 20 off 40 balls. Pakistan was reeling at 159-6, with leg break bowling all-rounder Shadab Khan (playing only his second Test) being joined at the crease by bowling all-rounder Faheem Ashraf, the latter making his Test debut. The pair raced to a 100-run partnership t0 lift Pakistan out of the doldrums and put Ireland under pressure. Bad light stopped play early with Pakistan on 268-6 after 76 overs, with Khan not out on 52 (91 balls) and debutant Ashraf on 61 not out off 69 balls, including seven fours and a six. The moral is that, in cricket, you can’t count your chickens before they’ve hatched or lower-order batsmen to get out for low scores. Pakistan has now played themselves into a solid position, and Ireland is going to have to man up in order to wrest the advantage back to take a first-innings lead and have a hope of going for a historic victory. Khan and Ashraf’s century stand was helped along by three slip-ups in the slips, first when Gary Wilson failed to slide his fingers under a low chance at first slip with Faheem on 24. This miss came one ball after Stirling (diving at full stretch to his right) had been unable to hold on to a slash from Khan for what would have been a sensational catch for the solid slipper. A third chance came with Ashraf on 36, the debutant getting a thick edge off Rankin which Wilson couldn’t latch on to. In truth, keeper O’Brien was at fault as he dived in front of his first slip and should have snaffled what would have been a good catch for a man with the gloves on – although one any quality keeper would expect to take. In O’Brien’s defence, the ball carried high off the pitch, which caused him to misjudge its flight. Ashraf went to a 52-ball half-century shortly afterwards. To be fair to Ireland, they have bowled well, put the ball in the right spots and found good movement off the pitch to beat the bat on many occasions… but you can’t force the edge. They’ve also mostly kept an attacking field-setting, much to captain Porterfield’s credit. All attention has been on the O’Brien brothers and their family legacy, but an even more impressive family achievement is that of the famous Joyce family. Ed Joyce officially became a Test cricketer today, in doing so joining his sister Isobel as Test-playing siblings. Isobel played in the Ireland women’s only Test to date and captained Ireland in 62 matches across all formats. She and Ed are now only the second brother-sister siblings to have played Test cricket, following Australia’s Terry and Denise Alderman. Main photo by Seb Daly/Sportsfile via Getty Images.